In a private session, the former vice president told the current one that Trump’s policy looks too much like Barack Obama’s. Cheney pressed Pence about Trump’s proclivity for making major policy announcements on Twitter and his off-and-on commitment to NATO, according to four meeting attendees and a source briefed on their remarks. The former vice president, who has kept a low public profile in recent years, questioned whether Trump places enough value on the findings of the intelligence community, which he has repeatedly and publicly dismissed. He suggested that Trump foreign policy has at times looked more like President Barack Obama’s — which Cheney has repeatedly lambasted — than that of a Republican standard-bearer. At one point, Pence, whom attendees described as taken aback by some of the questions, turned to his predecessor and inquisitor and joked, “Man, who wrote all these softball questions?” Cheney has served on AEI’s board of trustees since 1996 and, although he left office with low approval ratings, is generally held in high esteem by the crowd that gathered in Sea Island. The civil but tense standoff put a spotlight on enduring fissures in the Republican Party over its foreign policy. Trump has rejected the interventionism and democracy-promotion espoused by George W. Bush, who talked during his second term of “ending tyranny in our time.” But while the wars in Iraq and Afghanistan have dampened Republican support for the sort of pro-democracy hawkishness embraced by Cheney, many Republicans still believe Trump has gone too far in undermining America’s traditional alliances worldwide. Cheney has largely avoided public criticism of Trump over the past two years, telling allies he does not want to cause additional headaches for his daughter, Liz, who became a Wyoming congresswoman in 2016 and was elected to GOP leadership last year. Pence’s discomfort was on display when he referred twice to AEI’s outgoing president, who introduced him to the crowd, as “David Brooks,” the name of the influential center-right New York Times columnist — before correcting himself and noting that AEI’s Arthur Brooks is a longtime friend. Cheney homed in on two key issues, attendees said: The president’s tendency to make policy decisions on Twitter before notifying senior members of his own staff, let alone important allies, and his tendency to make such decisions without properly consulting aides and intelligence reports. That didn’t stop Cheney from grilling him. Citing what many conservatives derided as Obama’s “apology tour” through the Middle East, Cheney told his successor that, “It seems, at times, as though your administration’s approach has more in common with Obama’s foreign policy than traditional Republican foreign policy,” according to one attendee. 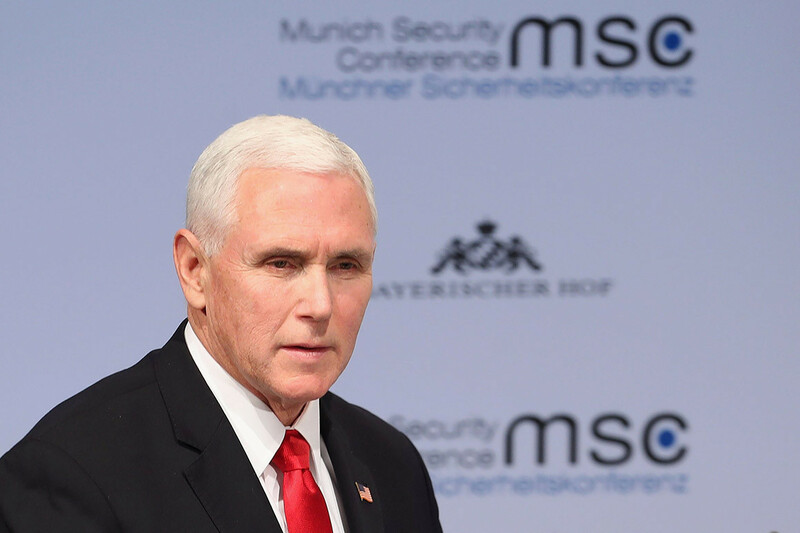 Pence responded by pointing to Trump’s “commitment to rebuilding our military and restoring the arsenal of democracy and noting that the president is “calling on our allies to live up to their commitments to do more.” When Cheney referenced news reports indicating that Trump had agreed to pull American troops out of Syria during a phone call with Turkish President Recep Tayyip Erdogan without informing key allies, Pence replied that the move had been under discussion for six months and wasn’t “made overnight,” according to a source briefed on the conversation. The standoff between the two was described by one attendee as “confrontational in substance, but not in style.” The weekend event attracted both pro and anti-Trump lawmakers, donors and intellectuals including presidential adviser Jared Kushner, Commerce Secretary Wilbur Ross, Chairman of the Council of Economic Advisers Kevin Hassett, Senate Majority Leader Mitch McConnell and Sens. Ted Cruz (R-Texas) and Tom Cotton (R-Ark. ), as well as New York Times Publisher A.G. Sulzberger and former Weekly Standard Editor Bill Kristol. “This AEI event was off the record, as a result we have nothing to share,” said Veronique Rodman, AEI’s director of public affairs. The vice president’s office declined to comment on the record, and a spokeswoman for Cheney declined to comment. Next articleWould you be fooled with a deepfake?